Access 100's of jobs per day. Build up your customer base, and earn daily rewards. Each month we have over 10,000 homeowners visiting us looking to hire a local tradesmen, across all areas of the UK. When you sign up to MyJobQuote, we'll ask you what type of jobs you want to receive, and how far you're willing to travel. Once a job is matched to you, we notify you via text and email. You can then review the choose those jobs which suit you. Ready to start receiving job leads? 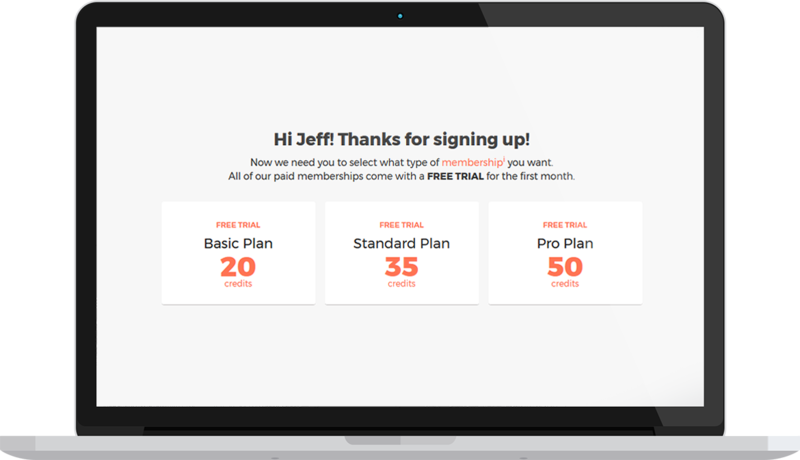 Choose from Basic, Standard or Pro subscription. Upgrade or downgrade at any time and easily switch to PAYG. Subscribers receive up to 50 credits each month. Use them to purchase job leads. The average job lead costs around 8 credits. Includes job description, location, job budget and cost of lead. Homeowner contact info made available on purchase. 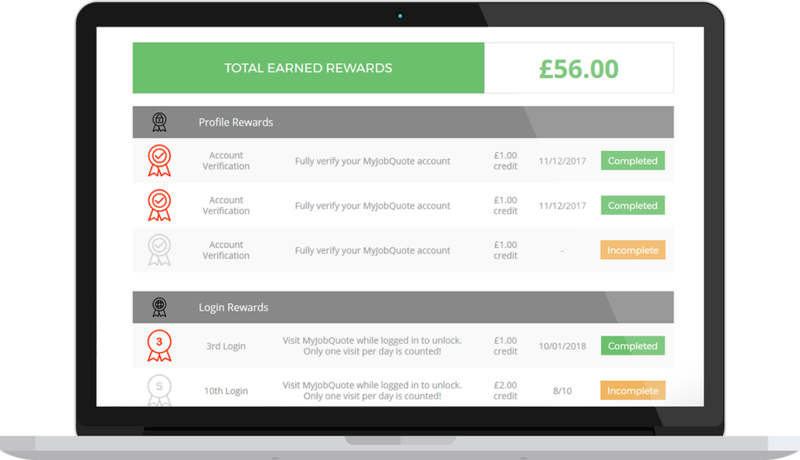 Unlock rewards with logins, lead purchases, reviews and more! The more you use, the bigger the rewards! 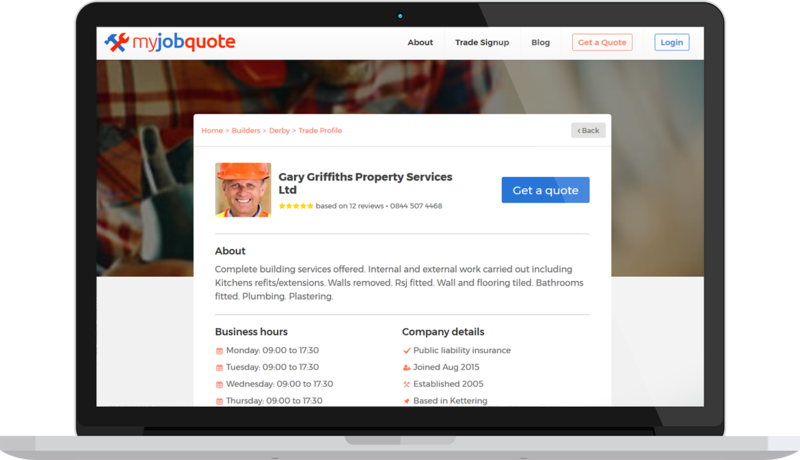 Get your own profile page on MyJobQuote. Rank naturally in Google & Bing. Upload recent job images to show off your skills. 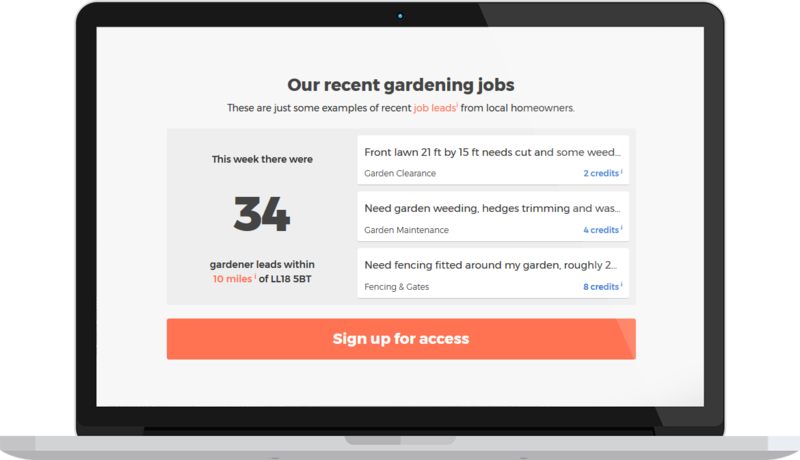 Whether you're a builder, plumber, or any other trade, find out how you can increase the number of job leads you receive. Read our helpful tips page on best practises when running your own business. For a more indepth guide on how our service works, check out our FAQ pages. In need of a patio or decking approx 5m x 3.5m slightly raised because of garden. Small flat roof needs to be repaired or replaced. Installing a garden tap, we already have the installation kit. Supply and install approx. 19m of 1.2m high treated featheredge fencing panels on top of a 300mm smooth gravel board using concrete slotted posts. Wallpaper one side of my front room. Job leads don't just grow on trees and if you're reading this page, chances are you're looking to get more. Word of mouth is the tried and tested method but it's not as effective as it used to be, especially when you're just starting out. 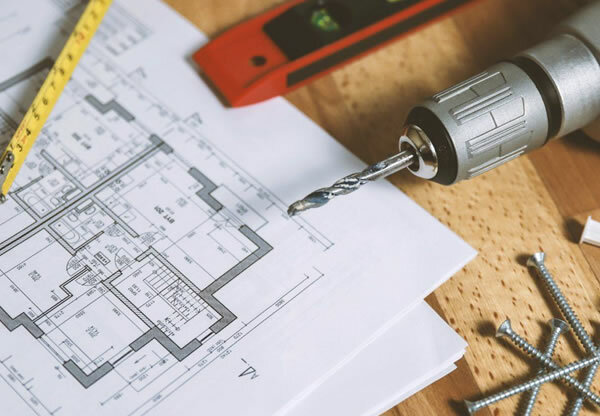 When you're new to the trade, the best advice is to take on as many small jobs as possible in order to build up your customer base. Taking your time with each job, making sure your work is excellent, and following up any issues, as well as charging a decent rate, is the best way to create a solid foundation for your business. But how do you get those initial jobs in? Or perhaps you've never quite managed to build up your base of customers? 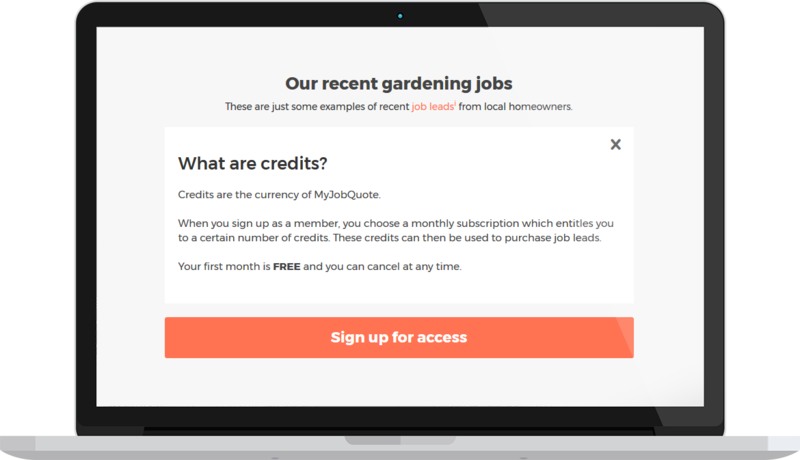 MyJobQuote could well be the solution for you!